Motorists have a responsibility to yield to other vehicles, pedestrians and bicyclists with the right-of-way. In some cases, drivers need to yield to certain types of vehicles, no matter who has the right-of-way. Failure to yield occurs when a driver fails to slow down or come to a complete stop for another motorist or a pedestrian when they have a legal responsibility to do so. If you have been issued a citation for failure to yield, it’s considered a noncriminal traffic infraction. You can receive anywhere from 3 to 4 points on your license (which will be suspended after 12 points), that’s on top of potentially being ordered to attend traffic safety school. 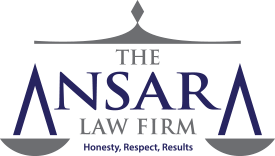 At The Ansara Law firm, our Fort Lauderdale traffic ticket lawyers understand there are a number of viable defenses for failure to yield, though each will depend on the circumstances of your case. It’s often worth it to fight a ticket – rather than simply pay it – because even if you don’t get it dismissed (which we often can help with), we can often help you walk away with fewer fines and other penalties. A citation for failure to yield – even if you caused no injury – can result in a fine of up to $500. With an attorney, you may pay a legal fee, but you often walk away paying less than you would have had the fine been imposed and better odds of a clean driving record. If you have questions about the costs and benefits of hiring an attorney to help you fight your South Florida traffic ticket, we can help. F.S. 316.075(1) – Failure to yield to a pedestrian in a crosswalk. F.S. 316.124 – Failure to yield to a vehicle with the right of way to a vehicle entering an intersection with stop signs or yield signs. F.S. 316.122 – Failure of a driver turning left at an intersection or into an alley, private road or driveway to yield to vehicles coming the opposite direction or vehicles that are lawfully passing on the left. F.S. 316.121 – Failure of vehicles approaching the intersection from different highways to yield to the first-arriving motorist, or else (if they arrive at the same time) the driver of the vehicle on the left failing to yield the right of way to the vehicle on the right. F.S. 316.0815 – Failure of a driver to yield the right of way to a publicly-owned transit bus traveling in the same direction which has indicated via signal the intention to re-enter traffic (this provision doesn’t relieve bus drivers of the duty to use reasonable care). F.S. 316.079 – Failure to yield the right of way to a pedestrian worker and/ or flagperson who are working to maintain or construct the roadway on a highway, so long as the driver had adequate notice (via warning signals) that such workers would be present. It should be noted that you can be cited for these offenses even if you didn’t realize you had an obligation to yield. Ignorance of the law will not be allowed as a defense. The good news, though, is you may have numerous defenses that will be effective in your case. Florida Uniform Traffic Citations revealed that in a single recent year, law enforcement in the state issued more than 78,000 tickets for failure to yield. Of those, more than 17,000 were dismissed. Many others were reduced. Each of the aforementioned statutes has very specific requirements. The burden of proof is on the government, and if any one of those requirements is not met, the case is likely to be dismissed. The traffic sign or signal was poorly visible/ not operational. We may also question the conclusions of the reporting officer. Understand that while the conclusions of the officer are not considered a piece of evidence – not the ultimate decision on the outcome of your case. Further, the officer’s observations and conclusions may be largely subjective. Courts do tend to give weight to the testimony of law enforcement, but that doesn’t mean it’s considered infallible. Finally, if the police officer in question fails to show up to court, the case is likely to be dismissed because without the officer’s testimony, the citation/ police report is considered hearsay. It’s certainly not a defense you can count on, but it does happen occasionally. Our traffic ticket attorneys in Broward County can help you consider the best argument to present.